Hearing Rabbits’ ears are very attentive to sounds – they move in all directions like a TV aerial and can also be turned independently of one another in order to pinpoint the faintest noise (their field of hearing is 360 degrees). Rabbits instinctively stop in their tracks when they hear a loud or unfamiliar noise; if they’re very worried they may suddenly run for cover – a reaction you have probably noticed in your pet rabbit too. It is very important to be considerate and do things quietly when your bunny’s around; if she likes to keep you company when you watch television or listen to music you should keep the volume reasonably low to avoid frightening her. Smell A rabbit’s sense of smell is very keen and his nose always twitching in order to pick up the faintest smells. Rabbits mark their territory by rubbing their scent onto things (“chinning”) and by leaving their droppings in key places; in the wild this is how rabbits signpost the way from their burrow to feeding places and back; this is also how your pet rabbit finds his way around the house and garden. Rabbits proceed very cautiously when they smell something unfamiliar (for instance another rabbit’s scent); having a sensitive nose they dislike the smell of strong household cleaners, cigarette smoke, perfumes and some cooking smells. You should only use mild detergents when cleaning your rabbit’s living area, for example, diluted washing-up liquid or diluted white vinegar. Eyesight Rabbits have large eyes placed on the sides of the head, which gives them a wide panoramic view with a field of vision of approximately 360 degrees. Their close-up sight is fairly limited – this is why your bunny tends to run between your feet and often seems unable to distinguish nearby objects. Rabbits can see better far away (in the wild they need to be able to spot their enemies in good time) and in the dark. Because their eyes show poor adaptation to light changes rabbits cannot see well in bright sunlight (suddenly turning the lights on will also dazzle your rabbit). Taste Rabbits can be very fussy about their food – they enjoy eating a variety of things and each rabbit develops her individual preferences. 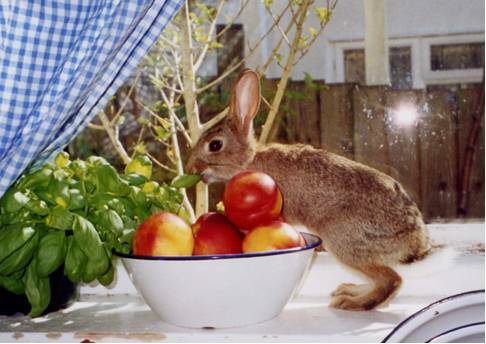 However rabbits’ taste buds have only a limited capacity to recognise harmful substances and contrary to what many people think rabbits don’t instinctively know to avoid poisonous plants, e.g. evergreens. Touch Rabbits use their delicate whiskers to find their way in the dark and (in the wild) to measure the width of burrows – rabbits’ whiskers are as long as the body is wide. Whiskers are very important to your bunny and they should never be pulled out, cut or touched unnecessarily. The whole of your bunny’s body is very sensitive to the touch so if your rabbit is worried about something, stroking and petting him will have a soothing effect.